Experts and crowds can produce valuable insights. But too often nonprofits and funders ignore the constituents who matter most, the intended beneficiaries of our work: students in low-performing schools, trainees in workforce development programs, or small farmers in sub-Saharan Africa. In bypassing the beneficiary as a source of information and experience, we deprive ourselves of insights into how we might do better—insights that are uniquely grounded in the day-to-day experiences of the very people the programs are created for. Well, we listen a little. On site visits, funders talk to participants in the programs they fund, but these are largely staged events and hardly represent a systematic solicitation of beneficiary responses. Some nonprofits survey those they seek to help, but the quality of these surveys is typically poor. There are usually no benchmarks against which to compare results, so it is difficult to interpret the information and improve performance. It isn’t that we don’t care about beneficiaries. They are, after all, why programs exist and why funders provide support. They are why those of us who work to solve tough social problems are inspired to work hard each day. Perhaps we don’t really trust the beneficiaries’ point of view. Maybe we’re fearful of what they might say—that without the benefit of “expertise” they might be misinformed or wrong. Perhaps we’re scared that we will learn something that calls our approach into question. Maybe we don’t know how to solicit beneficiary feedback routinely in a way that is reliable, rigorous, and useful. Or perhaps incentives aren’t aligned to value sufficiently the insights we have gathered. This distorted power dynamic makes it more important for social sector leaders to seek and use the voice of the beneficiary. In this article we provide examples in education and health care where the perspective of beneficiaries is systematically solicited and used to guide program and policy decisions. In describing these promising cases, we look at the value of that information and what makes it useful. We also consider the challenges to beneficiary feedback that are specific to the social sector, recognizing that beneficiary feedback alone is not the answer. We believe that listening to beneficiaries is both the right and the smart thing to do. Beneficiary perceptions are an underdeveloped source of information that can improve practice, leading to better outcomes. This isn’t a mere assertion on our part: a growing body of research demonstrates the link between beneficiary perceptions and beneficiary outcomes. Even in business, where the consequences of not listening to customers can be quick and brutal, rigorous focus on customer perspectives is relatively new.2 Jamey Powers, son of J. D. Powers, explained a few years ago that in the auto industry, it took some time to make the customer’s voice part of the industry standard. J. D. Powers started by surveying the customers of one company, and in time, other companies saw the wisdom of such a systematic approach. It now seems that every industry—airlines, hotels, and retailers—is benchmarking customer opinions about products and services through online surveys. When it comes to more rigorous approaches to beneficiary feedback, the greatest advancements have been in education and health care. Health and education nonprofits often have more resources than organizations in other social sectors (such as homelessness or workforce development); have well-defined and easily “captured” populations, making survey administration easier; and are under pressure (from regulators, the media, and sometimes for-profit competitors) to produce better results. | When we are designing a program or initiative, incorporating the beneficiary perspective can help us understand their needs, preferences, interests, opportunities, and constraints. | When a program is under way, rapid feedback loops that solicit the beneficiary viewpoint can help us adapt quickly. | Once a program concludes, understanding beneficiary experience as part of a rigorous inquiry helps us determine whether a program worked and why or why not. Five years ago, the three of us launched an initiative to help funders, schools, school districts, and education networks hear from their intended beneficiaries: high school students. The Gates Foundation was interested in understanding how students were experiencing the schools it was funding and asked CEP to create a program to collect and analyze student perceptual data. In the design stage—guided by a national advisory board that included education leaders, researchers, youth development practitioners, media experts, and a high school student—we analyzed existing efforts. We were surprised to find that, although a variety of student surveys existed, few seemed to be helping leaders in their decision-making. Many were poorly designed and lacked comparative data, making it difficult to understand what was a good rating on any given question. And most lacked good systems for sharing data with district leaders, principals, or teachers to inform their decisions. Students we spoke with expressed skepticism—if not downright cynicism—about the surveys. In focus groups during our design phase, students repeatedly said they doubted that anyone really cared about their views, or that survey results would be taken seriously. They rarely saw any data come back to them from the surveys they had completed. On the basis of our analysis, we saw an opportunity to do something better. We created a program called YouthTruth. Beginning with a pilot program at 20 schools in 2008, YouthTruth has gathered feedback from approximately 142,000 students from 28 districts and networks across the United States. The project solicits students’ opinions about their comprehensive school experience—including relationships with teachers, school culture, student engagement, perceptions of academic rigor, and preparedness for the future. YouthTruth was designed to emphasize comparative data, so leaders could easily understand the relative strengths and weaknesses of particular schools and programs. The YouthTruth model shares data in understandable ways: in-depth reports, individualized conference calls to discuss results, and access to an online library highlighting how other schools have used YouthTruth feedback. That focus on student perceptions as a force for continual improvement is what motivated the Aldine Independent School District in Houston to participate in YouthTruth. The district—with 64,000 students, 84 percent of whom are eligible for free or reduced-price lunch—won the Broad Prize for Urban Education in 2009. Despite its strong performance, school leaders wanted more data and they wanted to hear more directly from students. All but one of Aldine’s 11 high schools participated in the survey in 2011-12, and 73 percent of students completed the survey. Houston Endowment picked up the tab. The YouthTruth findings showed numerous opportunities for improvement. The districts’ schools tended to rate lower on school culture—questions like whether students agree with statements that “most students in this school treat adults with respect,” that “most adults in this school treat students with respect,” and that “discipline in this school is fair.” There was a wide range of differences in ratings of high schools, and district superintendent Wanda Bamberg noted that these differences tended to correlate with differences in academic achievement. District leaders are now using the YouthTruth results to guide their planning. Individual schools are drawing on the data in campus decision-making, from revisiting a discipline management plan to augmenting staff development programs and improving two-way communication with students. Aldine is hardly alone. An independent evaluation by researchers from Brandeis University found that 98 percent of school leaders who have participated in YouthTruth had used—or planned touse—YouthTruth data to inform specific changes at their school. In a more recent survey of repeat participants, 92 percent of school administrators agreed that they had used YouthTruth to make specific programmatic or policy changes at their schools. YouthTruth’s data collection and administration efforts—using online surveys and encouraging schools to make the survey a significant event in the school—have resulted in high response rates, averaging 76 percent in all participating schools. YouthTruth’s emphasis on comparative data requires that the core survey instrument be the same in all schools, but it was found that most questions have equal relevance regardless of context or geography—although the interpretation of results might differ. Districts and schools can add custom questions to get at specific concerns they feel are not sufficiently covered in the core survey. Participating schools pledge to share results with students. Gaining a commitment from schools to report back to students isn’t just to demonstrate respect for the time and thought students put into completing the survey. It also makes it more likely that school leaders will act on the results. For YouthTruth to make a difference in schools and districts over the long haul, it needs to be repeated at regular intervals. The overwhelming majority of participating schools plan to repeat, and many already do so annually. About half of the participating schools in the 2011-12 academic year were repeat users. This repetition allows school leaders to gauge progress and helps create a culture in which student voice is valued. Student perceptions can complement other academic measures, such as test scores, in assessing school performance. Research has demonstrated that there is a relationship between student perceptions and outcomes. Not only can students discern who is an effective teacher, but better student experiences—as reflected by selected student perceptions—have been associated with more positive academic outcomes. A YouthTruth module takes feedback to the level of individual teachers, giving school leaders an invaluable way of identifying teachers who are stars and teachers who need support. Although YouthTruth has created positive change, the project remains relatively small, covering just a fraction of the approximately 25,000 US secondary schools. Skeptics continue to wonder whether student perceptions can be trusted. Currently, there are only fledgling system incentives to help elevate student perspectives from a “nice to have” to a must-have continuing measure of performance.5 And finding funding for YouthTruth has proven difficult, as cash-strapped districts are limited in what they can pay, and the education-focused philanthropic community has been slow to embrace beneficiary feedback as a funding priority. Not only did the IOM report underscore the importance of patient-centered care, it also recommended aligning payment policies with quality improvement. This alignment became part of the Patient Protection and Affordable Care Act; private and public insurance and reimbursement schemes now include targets for measuring patient experience during hospital stays. Initially, the targets simply prescribed that hospitals collect data to measure patient experience, but in 2013 they will include specific goals for the quality of patient experience. Hospitals now use a number of measurement tools in this effort. Chief among them is the Hospital Consumer Assessment of Healthcare Providers and Systems (HCAHPS), which is intended to measure patients’ objective experience of care, not just their subjective satisfaction. The HCAHPS is a 27-item survey administered to a random sample of recently discharged hospital patients. The survey asks, for instance, about the nature and quality of a patient’s communication with his physician and nurse, a patient’s understanding of treatment options, and whether a patient felt treated with respect. All told, the core survey asks about 18 aspects of the patient experience. Many hospitals have collected information on patient satisfaction for internal use, but until HCAHPS there were no common metrics or national standards for collecting and reporting information about the patient experience. Since 2008, HCAHPS has allowed valid comparisons to be made among hospitals locally, regionally, and nationally.7 As of May 2012, the nationally benchmarked HCAHPS was being used by 3,851 hospitals, with 2.8 million completed surveys. Summarized data are also publicly reported so that consumers can be better informed in their choice of hospitals. The Cleveland Clinic used the patient feedback to implement “purposeful rounding,” whereby nurses check in with each patient every hour during the day and every two hours at night, to see how the patient is doing. This approach not only helped the Cleveland Clinic reach the 90th percentile in its HCAHPS scores, it also resulted in greater efficiencies. Because patients are assured that a nurse will visit them regularly, they have stopped using the call button as much as before, allowing the nursing staff more time for quiet, uninterrupted treatment planning. The California HealthCare Foundation (CHCF) has spent many years trying to improve the patient experience in safety net clinics throughout California, simultaneously trying to help clinics lower costs and improve health outcomes. CHCF recently supported a study of the Consumer Assessment of Healthcare Providers and Systems (CAHPS) survey and other patient surveys to determine the best method for soliciting feedback from patients in safety net clinics.9 Overall, the surveys were disappointing and underscored the challenges of reaching this population. Beneficiary response rates ranged between 14 and 36 percent, too low to generate much confidence in the results. There were multiple reasons for the low response rates. Literacy was an obstacle, especially for the long CAHPS survey. Limited access to computers and the Internet, both within and outside of the clinics, also constrained efforts to collect data. And the clinics had difficulty generating accurate lists of patients to survey. Although we believe that rigorously listening to beneficiaries is powerful, there are, as we have seen, several significant challenges to this work. It’s expensive | Reaching beneficiaries can be expensive and time-intensive. Schools and hospitals provide controlled environments, with significant resources, in which it is relatively easy to reach people. Even with these advantages, the cost of delivering a YouthTruth survey and playing back results to a school is several thousand dollars per school. We are working hard to drive down those costs without compromising rigor or quality, but it isn’t easy. For human services organizations, where the beneficiaries can be difficult to survey and where the budget constraints are especially severe, it’s easy to see why this work often falls off the priority list. It’s difficult to get responses | Many intended beneficiaries lack Internet access. Others are less than fully literate, making it difficult for them to understand and respond to a survey. For many, being a beneficiary of a vital service can engender fear and anxiety and a resulting reluctance to respond to surveys candidly. We saw the cynicism in our student focus groups when we were exploring the potential for YouthTruth. Likewise, safety net clinic patients were often quite reluctant to participate in the patient surveys, possibly out of fear of reprisal. It makes us uncomfortable | Hearing from those we are trying to help can be challenging. What if they don’t think what we do is working? What if their perspectives call into question our most fundamental assumptions? People working in the nonprofit sector are overwhelmed by demands for help and work hard to meet them. It can be difficult to then take the extra step of creating rigorous feedback loops. In health care and education, when beneficiary feedback is collected with improvement in mind, it leads to better decisions. Still, collecting and using rigorous feedback from beneficiaries remains too often the exception rather than the rule at nonprofits and foundations. Admittedly, health care and education are easier fields in which to collect beneficiary perceptions than fields whose client population may be more transient, such as homeless shelters. But we believe that there is likely to be a relationship between the degree of difficulty in collecting the feedback and its ultimate value. That’s because the fields in which beneficiary feedback is more difficult to collect are likely to be the very areas in which the intended beneficiaries are especially lacking a voice. These links suggest that beneficiary perceptions are useful leading indicators of the longer-term outcomes we seek. Leading indicators are important because they allow decision makers to make improvements while the program is under way, rather than waiting until after negative outcomes—patients dying or students dropping out—to make adjustments. Beneficiary feedback isn’t just the right thing to do; it’s the smart thing to do. The authors wish to acknowledge the feedback we received from colleagues who commented on an earlier draft of this paper: David Bonbright, Paul Brest, Barbara Chow, Jack Fischer, James Knickman, Larry Kramer, James Merlino, Christy Pichel, Melissa Schoen, Rhonnel Sotelo, Jane Stafford, and Daniel Stid. 1 Daniel Stid, “The Power of Seeing Things from the Beneficiary’s Perspective,” The Bridgespan Group blog, July 28, 2011. 2 James L. Heskett, W. Earl Sasser, and Leonard A. Schlesinger, The Service Profit Chain: How Leading Companies Link Profit and Growth to Loyalty, Satisfaction, and Value, The Free Press, 1997. 3 Ellie Buteau and Phil Buchanan, The State of Foundation Performance Assessment: A Survey of Foundation CEOs, The Center for Effective Philanthropy, 2011. 4 Important efforts to bring beneficiaries into nonprofit governance and staffing models have also emerged in recent years. These efforts warrant attention, but our focus here is on the systematic collection and use of perceptual data from beneficiaries. 5 State of the States: Trends and Early Lessons on Teacher Evaluation and Effectiveness Policies, National Council on Teacher Quality, 2011. 6 Moira Stewart et al., “The Impact of Patient Centered Care on Outcomes,” The Journal of Family Practice, 2000. 8 Susan Edgman-Levitan et al., Feedback Loop: Testing a Patient Experience Survey in the Safety Net, California Health Care Foundation, 2011. 10 Seth W. Glickman, MD, et al., “Patient Satisfaction and Its Relationship with Clinical Quality and Inpatient Mortality in Acute Myocardial Infarction,” Cardiovascular Quality and Outcomes, March 2010. 11 M. Church et al., “Perceptions of Classroom Environment, Achievement Goals, and Achievement Outcomes,” Journal of Educational Psychology, 93(1), 43-54, 2001; R. Carini et al., “Student Engagement and Student Learning: Testing the Linkages,” Research in Higher Education, 47(1), 2006; and E. Allensworth et al., “What Matters for Staying on Track and Graduating in Chicago Public High Schools,” Chicago Consortium on School Research, 2007. MET study, 2010. 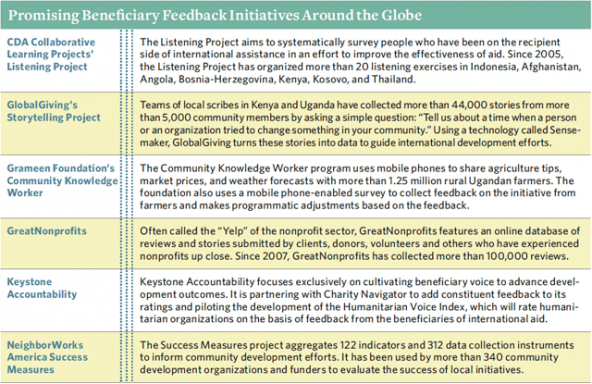 Click here to read more about beneficiary feedback on the Stanford Social Innovation Review website.